One of my sons brought this bottle of Hill Billy bourbon home last year. I tried it once back then, which is also about the time I modified the label and made it into a bottle of “Hell Billy”. 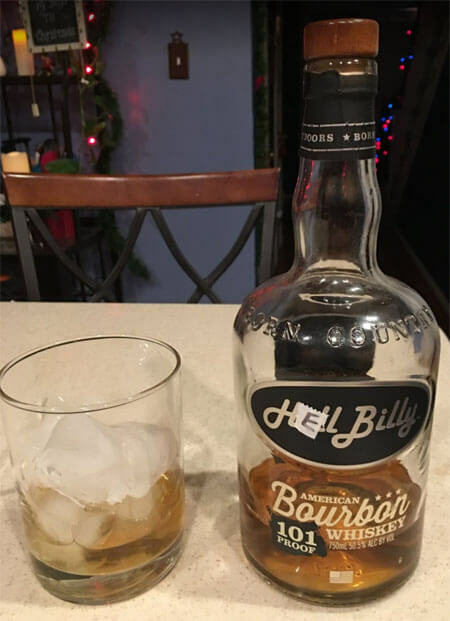 Last night I was organizing my liquor closet, trying to make some room, and what did I find at the back of the cabinet but my old friend Hell Billy. I poured a glass over a few ice cubes and took a sip. The year in the cabinet didn’t change anything for the better from the first time I’d tried it. Hill Billy had a faint but very unpleasant antiseptic aftertaste that overpowered hints of vanilla. I’m going to give Hill Billy a 9/100 as I can’t really see ever getting another bottle. Tastes a little bit like someone poured some antiseptic into a glass of cheap bourbon.